Looks great in my sons room..... he loves it! Bring their imaginations to life with whimsical bedding collections by Waverly Kids. 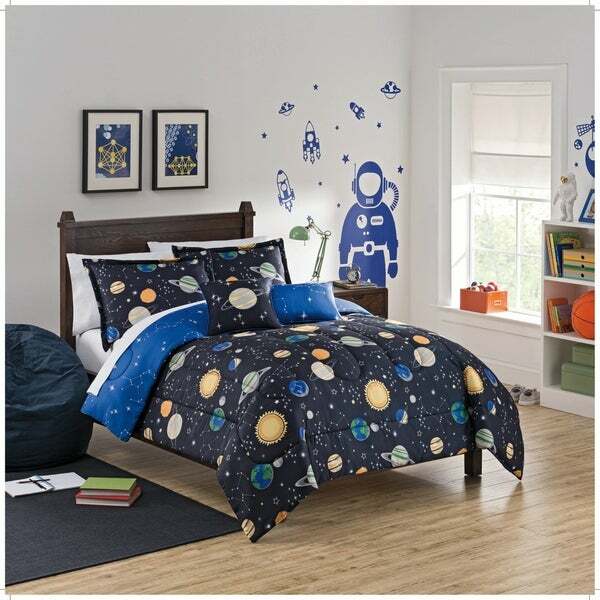 This adorable collection features an allover space themed layout with sun, stars, and planet motifs. Reverse features allover constellation print. Set includes reversible comforter and coordinating shams. Coordinating Space Adventure decorative pillows sold separately. Dimensions 88.0 In. X 1.0 In. X 90.0 In. We ordered this for my son's birthday to along with a space-themed room, and he LOVES it. He's looked forward to falling asleep in his big-boy bed every night since! Highly recommend. Adore this comforter, and the bonus is the reversible side has constellation on it! It fits perfectly into my sons room. Perfect for any child that loves outer space! Great comforter for kids! The fabric is soft and appears durable. I found matching pillows on a different website to complete the set. Highly recommend! I love seeing the look on each of my son's face when they get mail, especially if it is an "Overstock" box. My 6 year old wants to be a Starsailor AKA Astronaut when he grows up! He has a bunk bed, so I ordered a Twin and Queen! They go perfect with his room, extra plush and comfortable. I bought this for my grandson's "space themed" bedroom. 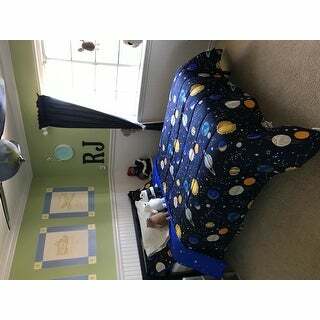 The colors are bright, vibrant and make a dramatic backdrop for his rocket ships, stars and planets! He loves it! Perfect for my 3-year-old son's space room. He loves it! The colors really pop and the quality is nice. I would definitely order this again!! Soft comforter that fits bed beautifully. My 10 year old now never wants to get out of the bed! Nice quality and details make this the perfect addition to his bedroom. Bought this comforter for my grandson - he loved it. Great quality. This is a wonderful comforter. My grandson really loves it for his room and enjoys looking at the planets. Thi bedding is gorgeous and true to color. My son loves it! Nice bedding for our grandson's new joint bedroom. My son loves it! Quality is great and it’s so soft! Looking forward to putting it on his new bed soon. Love this!! Nice quality for the price. Grandson loves it too. My grandson chose this one he liked the way it looked. We will see how the quality is when we recieve it. "Where do put the size you want? I need a queen size please and thank you! " on the right side of the picture is a box for two different sizes, one is twin and the other is full/queen. Just click on size you want and add to cart.